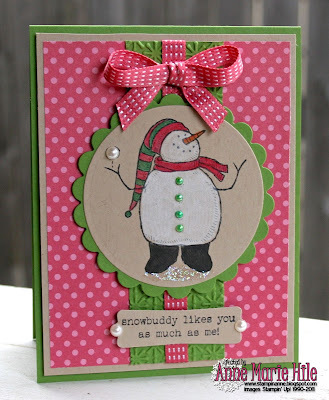 Stampin' Anne: Snowbuddy Likes You and the Paper Players, Too! Snowbuddy Likes You and the Paper Players, Too! Hi ya'll! Pardon me while I dust the cobwebs off my blog. It has been a while since I have posted and I do apologize. The past two weeks have been a blur for me and unfortunately I have not had a lot of time to spend in my stamp studio. I have not fallen off the planet, I promise. 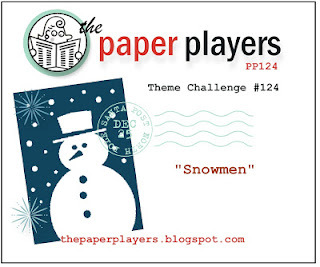 This week at the Paper Players, my dear friend Ann has a theme challenge for us. What can I say? I do love the snowmen! Probably because we don't see them very often here in South Texas. I have an affection for bright Christmas cards, so I went with my new favorite color combo of Primrose Petals and Gumball Green to get my card started. I have never inked up this chubby snowman image from the Snow Much Fun stamp set...I always seem to use the tall snowman in the set. So this cute chubbi-licious guy finally saw some ink (and some watercolor pencils). I colored his pearl buttons with a marker and added some Dazzling Details to the "ground" under him so he didn't look like he was floating in air. I listed all of the items I used to create the card at the end of my post. Please stop by and play along with us this week at The Paper Players! The super-awesome Design Team worked their magic once again to create some "snow-tastic" cards for inspiration. Before I go, I wanted to share a photo of the sweetest kitten EVAH, Miss Abby! We put the big tree up today and she stopped in her tracks when she came downstairs to see it for the first time. I have a feeling we are in for a wild ride with her in the next couple of weeks....Fa-la-la-la-la! I love your use of Primrose on this...it's such a soft and sweet look as compared to a red. Oh this is so sweet! I love him stamped onto crumb cake and coloured with watercolour pencils!!! Must do this soon! Been ages since I pulled them out last! 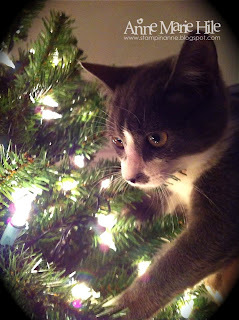 Abby is a cutie and I can't wait to hear what adventures she'll be taking with the tree this year....haha! Abby is the most awesome! I bet we'll be seeing more "in the tree" pictures before too long. Ha! Good luck. Anne Marie, this is so cute and pretty! I love the color combo you used too! VERY nice! Have fun with that kitty and the Christmas tree! Ours just likes to sleep under it - I guess she thinks she's in a jungle! What a fun card Anne Marie, I love the polka dots and this playful image. Oh my word look at that precious fur baby!!! The images in my head of her having a frolic in that tree...whew...good luck girl!!! The Primrose & Gumball are fun & fabulous together, Anne Marie & your chubby snowman is super cute too! Love the 3D snowball & the Crumbcake base. I love this little dude, especially on Crumb Cake!! Your bright colors are a fun touch! AND that little kitty.....oh, I miss my Pumpkin so much! I am enjoying her vicariously through you and your posts! Have fun!!! Cut cute image, love the pink! That lil snowman is so cute! Adorable, Anne Marie! This is a great color combination! I love this sketch! Cuddles to Abby from the Twins and Lexi! OK, lots to cover here! First, soooo glad you're back and stamping... Second, LOVE this card--that little man is so cute on crumb cake, clever girl you. Love it and adore the pink/green color combo. Your bow is perfect! Third, OMG Abby is precious! The wonder in those little kitty eyes is priceless. Big hugs, my friend!! AM, this is a adorable. I love the PP and GG - it's a really bright, cheerful, really well matched color combo. I also the little pink buttons you gave him. The bow is the perfect finishing touch. Love your card and i LOVE SMOWMEN....love your colors too. I totally understand about not blogging alot... I've been on a whirl wind since I visited my grandkids and haven't posted a thing! hugs. Great job. Love the colors of this. Great job with the ribbon and coloring in the snowman. Very cute cat pic too! You always have such interesting details on your cards! I love love love the green buttons! Great to have you back Anne Marie - I've missed you lovely creations! 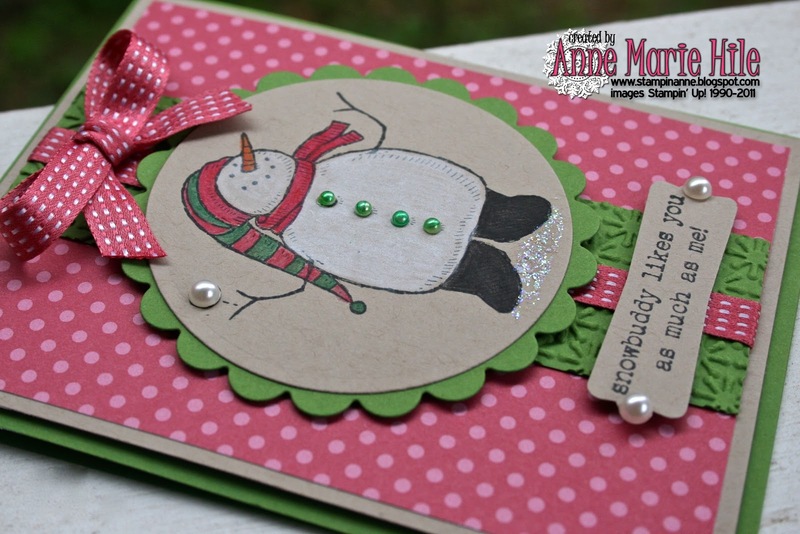 This one is perfect as usual - love the colour combo, the snowman on crumb cake and the pearl embellishments!